"Marked as special at an early age, Jacinda knows her every move is watched. She longs for the freedom to make her own choices, but when she breaks the 'no flying' rule, she nearly pays with her life. Until a beautiful stranger saves her. A stranger who was sent to hunt those like her. 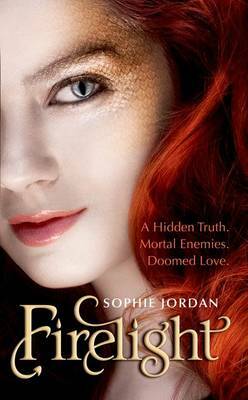 For Jacinda is a draki, a descendant of dragons whose greatest defence is her secret ability to shift into human form. And her rare ability to breathe fire makes her desirable, and important, to the survival of the draki. Forced to flee into the mortal world with her family, Jacinda struggles to adapt to her new surroundings. There she meets gorgeous, elusive Will who stirs her inner draki to life. Although she is irresistibly drawn to him, Jacinda knows Will's dark secret: he and his family are hunters. She should avoid him at all costs. But her inner draki is slipping away, and if it dies she will be left as a human forever. She'll do anything to prevent that. Even if it means getting closer to her most dangerous enemy." I had been wanting to read this book since its release, so when I finally got a copy, I read it within 3 hours and absolutely loved it to the core. From the first page I was spellbound. I have to say this book is so wonderful I find it hard to put into words. It’s also so very unique. I can’t say I’ve ever read a book quite like it, or should I say with the creatures within it quite like it. I mean to invent a whole new race of creature is amazing. I mean Draki’s seem pretty cool! I just want to know what an Enkros is. The book basically follows, Jacinda, the only Fire breathing Draki in generations, who has been pledged to the son of the tribe alpha. Her mother doesn’t like it so they move away, and her mother tries to kill of her Draki. But then she meets Will, and he (mind the pun) relights her fire. Slowly they draw closer, but Jacinda knows that his family hunt her kind. Then it sort of gets out and it’s a big fight for their love. The book is written pretty well, in 1st person, but I think it may have benefited from character changes. Other than that though I liked it. I felt it was a nice, fast paced novel. It didn’t drone on, it got to the point. I think if it wasn’t for the Supernatural take on the story it would have been a very boring, but with the twist it was an action packed, romance novel that kept you enticed every step of the way. The plot was a simple, clichéd, supernatural creature, human forbidden love one, but I felt that it worked very well with Firelight, and unlike with some other books, it didn’t felt overused. I don’t know if it was because of the unique-ity of it but I like it. My favourite character would have to be surprisingly, Azure with Jacinda in second place. I know she was a very minor character but I felt she could be interesting to read about and that we didn’t get enough of her. I would love to see what life in the tribe was like and what sort of powers a water draki has. Jacinda takes second place for the whole Fire breathing thing. Speaking of powers, I don’t think they got used enough. These Draki have powers. Use them! I would have loved to see some characters a bit more action involved. Overly the book was a very simple, light, quick read but I did like it a lot. Now I am literally dying to read Vanish, so bad, so maybe I’ll get a copy.